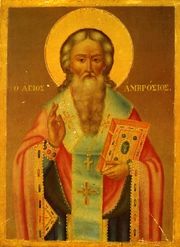 Flashing lightning-like with godly doctrines, thou, O Ambrose, dravest off the darkness of the impious error of Arius; and working wonders and signs by the Spirit's might, thou, O good shepherd, didst heal divers sufferings. Righteous Father, thou initiate of sacred mysteries, entreat Christ God to grant great mercy unto us. Share the feast of Ambrose, Bishop of Milan with an icon greeting ecard.